It seems like it’s been some time since I’ve done a review of a restaurant. Perhaps that’s because I am filling in for a friend at the Moxie Performing Arts Theater several times a month as a Front of the House Manager. Perhaps it’s because I seem to spend a few days a month in North Dakota learning how to milk goats. Maybe it’s that I’m not always able to find someone to go with me to try out a new place. Whatever the reason, I’m back in action. Wong’s Golden Palace was chosen by my friend, Warren, who went with me to see a play at the Moxie Theatre and knew the restaurant was conveniently nearby. It has been a long time since I’ve had Chinese food — with so many different Asian style restaurants around now I’d forgotten how much I really enjoy the cuisine. Warren works the “territory” around the restaurant, so he knew it well. 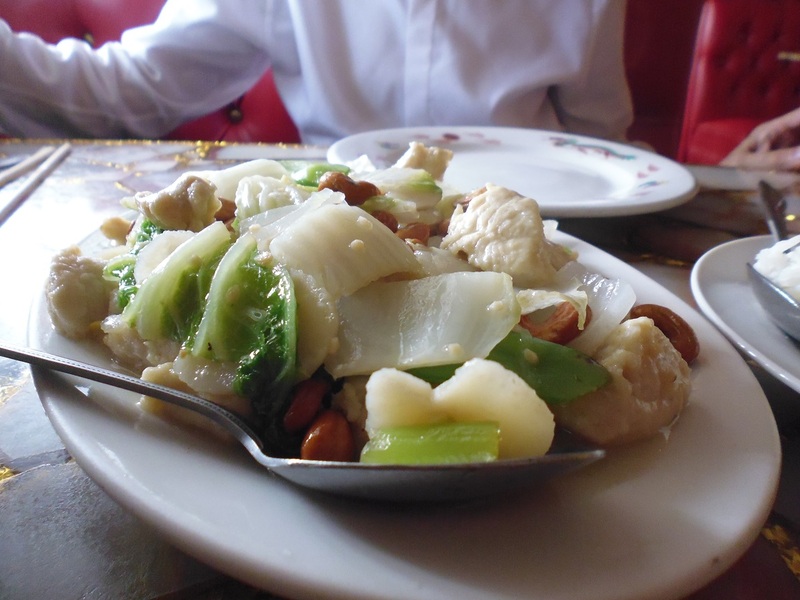 The waitress knew what he liked – Cashew Chicken – and asked if he was going to have it that night. He did. The menu is very extensive. There are several specials– I remember ordering those dinners a long time ago when my children were young – the soups, the appetizers — with each one getting a choice of an entrée and everyone sharing. Wong’s Golden Palace has nine separate dinners, beginning with the Cantonese Dinner at $10.75 and ending with the Imperial Seafood Dinner at $18.50 per person. In addition to those dinners there are appetizers, soups, salad, chef’s suggestions, beef, pork, poultry, seafood, chow mein, chop suey, sweet and sour, noodles, egg foo yung, vegetables and a variety of rice. Their prices are reasonable and the food that I tried was very good. 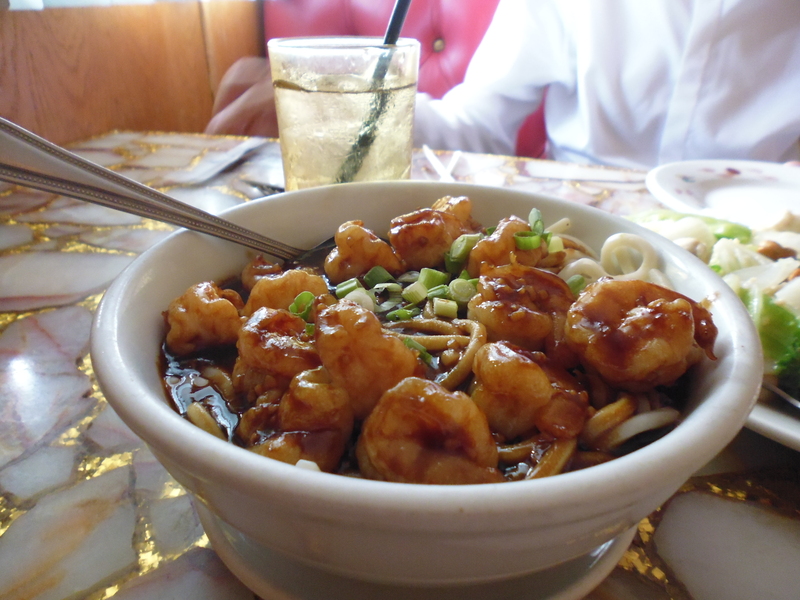 I would have liked to order one of the dinners, but since the waitress already knew what Warren wanted I quickly selected an order of Shrimp Lo Mein. ($10.50.) I was not disappointed. The amount served was enormous. Warren and I shared both orders; I took home the rest of the Lo Mein, and my students and I ate it for two more days. It was tasty, crisp, and served hot. The shrimp were cooked well; they didn’t taste tough or frozen, as so many shrimp dishes do. Warren’s Cashew Chicken ($8.75) was also served hot; with a big plate of rice on the side, and the veggies were fresh and cooked well. 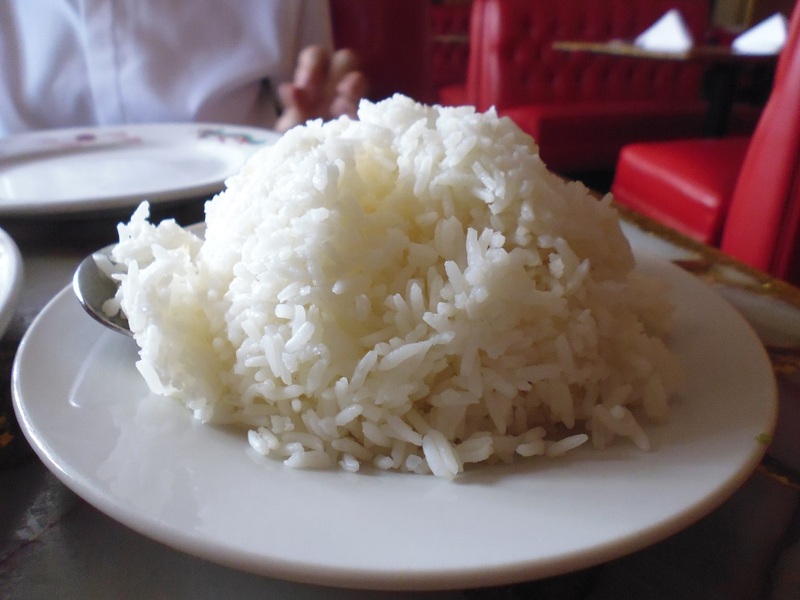 In addition to the large menu offerings of Chinese food, there are also American and children plates to choose from, such as burgers and sandwiches. One could eat here every day for six months and not sample everything offered on the menu. Our total bill was just about $20 – and we would not have complained if it was more. 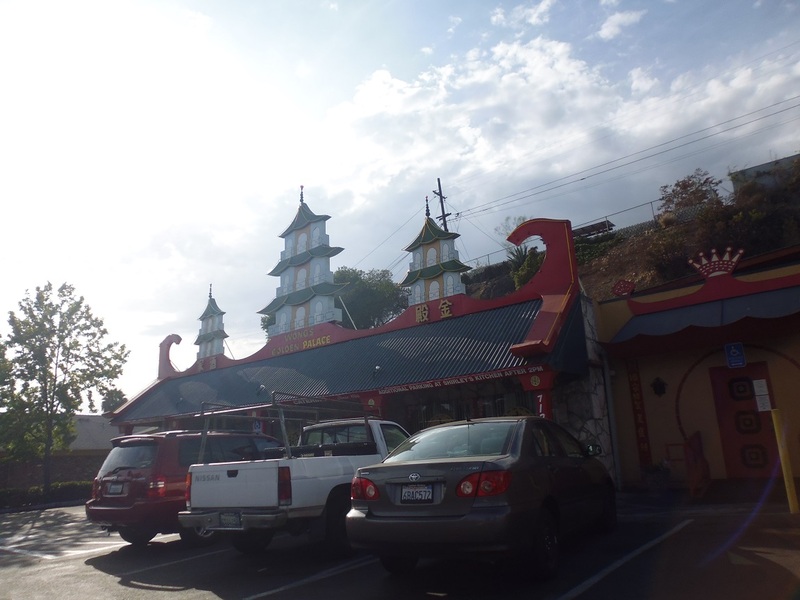 I look forward to returning to Wong’s for the good food and excellent service. Maybe next time I’ll catch the live music offered in the restaurant’s bar section. It’s right in my area and I’m ashamed to say I’ve never eaten there. Maybe it’s because there is a pet hospital right next door and I can’t help but thing of the 101 ways to Wok your dog! Well, I didn’t see any “dog” on the menu, not that I looked, but the vegetarian dishes should be safe. Really, Ro, it was very good. But what is that they say about everything tasting like chicken? Oh yeah! It was chicken cashew!!!! It sounds good. Thanks for the review. Sounds like you’re having fun on the ranch. I’d go back with you, Joe.